Great post on the Mississippi Drive Corridor Project and Planning for People and Places by Kevin Jenison, Communications Manager for the City of Muscatine! I recently ran across the accompanying picture posted by Project for Public Spaces on Twitter and I could not help but think just how valid the point is and just how much it resonates with the reconstruction of the Mississippi Drive corridor. “If you plan cities for cars and traffic, you get cars and traffic. If you plan for people and places, you get people and places.” – Fred Kent. Kent is one of the founders of Project for Public Spaces and one of the leading authorities on revitalizing city spaces. His PPS biography also notes that he is one of the foremost thinkers in livability, smart growth, and the future of the city. And the future of Muscatine is what the Mississippi Drive Corridor Revitalization Project is all about. The vision began with a thought to transform a riverfront filled with old buildings, grain bins, and a switchyard into a park that the citizens of Muscatine could be proud of and visitors would want to make a destination. 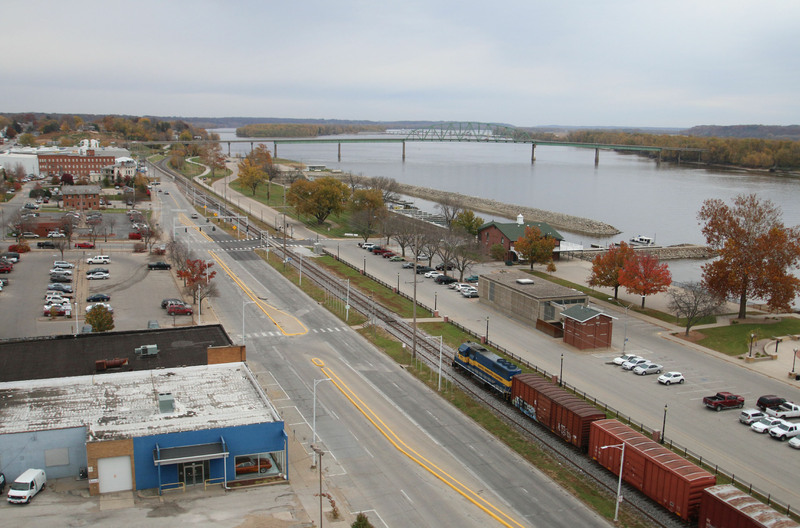 Out of that, according to Steve Boka, former Community Development Director for the City of Muscatine, came the realization of a strong connection between the riverfront and Downtown Muscatine, and the need for a safer Mississippi Drive. Green spaces like this one at Riverfront Park allow individuals to enjoy social interaction and nature along the banks of the Mississippi River. The wide sidewalks, sitting areas, play areas, and landscaping add to the walkable nature of the park. These and similar concepts will be used as the City of Muscatine continues its efforts to transform the downtown business district and other areas of the community into more pedestrian friendly gathering places. Check out Muscatine’s latest complete and green streets efforts on radishmagazine.com – Going for green: Muscatine to receive EPA assistance for sustainable design. 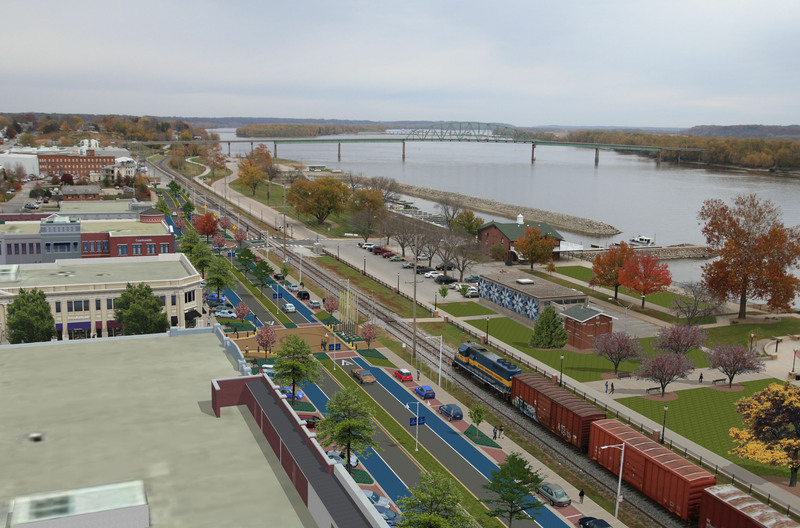 As we prepare for the September 1, 2015, Kick-off of the Mississippi Drive Corridor Project, I wanted to pass on an educational piece that highlight’s the vision for transforming Mississippi Drive. This piece was put together after 30 city staff, business and property owners, health practitioners, regional planners and resident leaders came together under the direction of Dan Burden, national walkability expert, to begin to re-envision Mississippi Drive. We identified what Muscatine currently lacks in the Mississippi Drive Corridor and found ways to potentially address those needs with changes to the built environment. Right now, we have an incredible opportunity to connect our downtown to the riverfront with this project. We can transform this corridor into a key focal piece for our community. Transforming Mississippi Drive will serve as a catalyst for economic development, community health, well-being and overall livability. Please take a look at the Mississippi Drive vision piece and plan to attend the kick-off on Sept. 1. More details about the kick-off event will be released soon. Click here for more info on the Kick-off Event! Check out the following links! Save September 1 and plan to attend a kick-off event for the Mississippi Drive Corridor Project. The event will be held at the Muscatine Riverfront, with specific location and time information to be released soon. What is the Mississippi Drive Corridor Project? It is a proposal for reconstructing the 1.6 miles of U.S. 61-Business (pavement and curb/gutter). It also includes street lighting, landscaping, gateway features, pedestrian crossings, sidewalk improvements, traffic signals, geometric improvements, storm drainage improvements, and road embankment work intended to improve flood protection. The work will focus on four distinct areas adjoining Muscatine’s Central Business District. The improvement segments include the HNI Campus Area, Downtown Area, High Sidewalk (Bluff) Area and the Carver Corner Area. “What can livability look like in a rural context? How about a suburban one? And what can be done to make existing urban conditions more walkable and bikeable? So, click on the above photo and check out this great new resource!